By Dale Johnson Posted: July 20, 2017 4:00 p.m.
A psychology student at the University of Regina is looking into how patients view their experiences with the medical system. 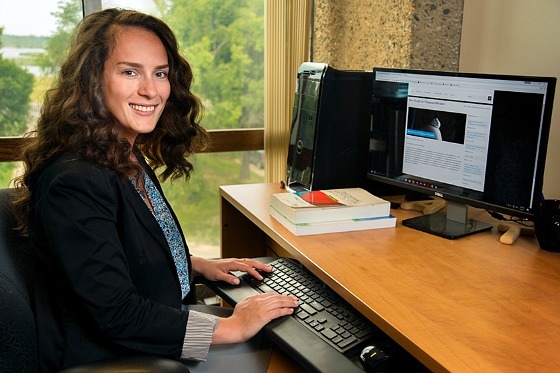 Andreea Tamaian, a PhD student supervised by Dr. Bridget Klest, is looking into what is called “institutional betrayal,” which describes how the actions and inactions of a particular system – such as the medical system – affects patients. "The perception of betrayal by the medical system is strongly related to patient dissatisfaction and increased risk of mental health concerns. Some types of events might be detrimental to the well-being of anyone who experiences them. At the same time, some events may be interpreted differently by different people, and therefore only negatively affect some individuals. For my PhD research, I want to better understand what types of events lead to feelings of institutional betrayal, and to understand individual differences that lead some patients to view certain adverse medical interactions as betrayal while others do not perceive them as such," she explains. Tamaian says targeting one specific medical event – childbirth – will allow her to gather information from patients both before and after, and therefore better understand the kind of medical events that lead to betrayal, as well as the individual factors that influence how the event is perceived. Tamaian says there is already research that indicates institutional betrayal is predominant within our own medical system and it affects patients’ mental and physical wellbeing. “A previous study completed by the Social Context, Health, and Trauma Lab looked at a sample of Canadian adults with chronic medical conditions, and found that institutional betrayal predicted poorer mental health – such as anxiety, depression and PTSD – even after controlling for other factors that are linked to poor mental health status, like low socioeconomic status, previous traumatic experiences and poor social support,” she says. Tamaian’s project is funded by the Saskatchewan Health Research Foundation. “We are hoping that the findings of the current research will extend these findings to the general population, and be able to show that one particular experience within the medical system – childbirth – can lead to feelings of institutional betrayal and can therefore have detrimental effects on the well-being of new moms,” Tamaian says. She thinks her research may ultimately help to improve overall distribution of care in the Canadian medical system and understand systemic factors that exacerbate post-traumatic symptoms patients may experience. The data collection began at the end of May 2017, and she hopes to have all the data collected by May 2018. “This is a longitudinal study, and we are reaching women at three separate time points. Right now we are in the first phase, when women are in the third trimester of their pregnancy. We are interested to see how their experiences with the medical system during pregnancy and childbirth affect women’s mental health postpartum. Participants will complete two additional online surveys at one month and 3 months postpartum,” she says. Tamaian is looking for participants to take part in her study. Eligible participants must live in Canada and be in the third trimester of pregnancy. Participants will be entered in a draw for one of 20 gift certificates worth $50 each. For further information about this study, or to volunteer, please email her at tamaiana@uregina.ca.